There are plays that leave you in two minds about contemporary theatre. ‘Go to Gaza’ playing in North London was one of them. The experience meant to be truely total, my friends and I squatted on pillows, sacrificing comfort for Arab authenticity. The strikingly designed stage consisted of a mound of abandoned shoes. It would have been enjoyable if it wasn’t for the overwhelming fumes that would invariably shorten the life of an asthmatic. Never since the filming of Michael’s Jackson’s ‘Beat it’ has so much fumes been released in the atmosphere in the name of art. But seeing, with a bit of effort, passed the aesthetics and you are from the onset struck with a message: In Gaza, People die! Mostly miserable deaths caused or worsened by the Israeli occupation. Whether on the beach or in the camps, in their houses or on the roads, eating their dinner or firing AK-47s they die. 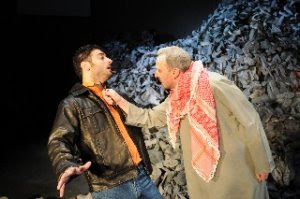 This omnipresent threat of death drives the play, through the obsessions and ruminations of the main character, a Palestinian young man. Too well-dressed, middle-class and detached from his surrounding(Not that the three are intrinsically linked)he is presented to us with too little background to allow empathy to develop. While all the main characters are Palestinian, an Israeli refusenik is thrown suddenly in the mix. Representing a fringe movement, she provides no real insight into the Israeli side of events. This is left to Mark Regev and Alan Dershowitz through recorded news interviews. Their smug, technical account of events is in contrast with the screams and sounds emanating from the strip. And here lies the problem for me; again Arab characters seem to shine in their state of emotional victimhood all the way to their decision to die a martyr of a generic colourless and faithless resistance far removed from the reality of Hamas and Islamic Jihad. Although full of energy, the choreographed closing piece is too reminiscent of the PLO training camps of the 1970s, reflecting a phase of the struggle with which the traditional British Left is more at ease. All in all, I felt the play too targeted at a western audience to strike a chord with me. At times the attempts to help this audience identify with the sufferings of a Palestinian mother felt less than subtle (using the Madeleine McCann analogy) and with the potential to backfire. On a more positive note, the play contains moments of striking rawness and authenticity. My favourite being a father’s account in Arabic of a confrontation with the Israeli military machine that left his family in tatters and his home destroyed. As I left the theatre I reflected on the weeks that followed the savage Israeli assault. With the siege still in place the Gaza strip is still on the mind of many activists. Not a day passes without a concert for Palestine, an exhibition for Palestine or a dinner for Palestine; all done in genuine support of the struggle of this people denied a land and an identity for too many years. This buzz coincided with the 50th anniversary of the 1959 Tibetan uprising against Chinese occupation on 10th March. The irony that this now province of the People’s Democratic Republic of China has enjoyed public Western sympathy for many years wasn’t lost on me. Over the years, the Tibetan cause has become the equivalent of a cuddly cub or a helpless puppy: cute, popular and everyone’s favourite pet. It enjoyed the right celebrity endorsement and became an unavoidable political topic. But whether you believe the Dalai Lama is a peace loving saint or an astute manipulator, you cannot but acknowledge that when things get serious Tibetan freedom is downgraded to the level of East Timoran stability. On a recent visit to China, the appointed international face of Obama’s promises of change, secretary of state Hillary Clinton, demonstrated the A to Z of post-modern Realpolitik. With the latest global financial downturn, a people’s rights to freedom and auto-determination are relegated to the anti-chamber while mutual interests dominate the agenda. I wonder in that environment what chance the Palestinians have of seeing progress on the peace process in the foreseeable future. They, because of their persistent struggle, in its guerrilla version, its international terrorism version, its rock throwing version, its suicide bomber version or its Kassam Rocket version have no chance of playing at the cuddly puppy. Despite all the best efforts of their supporters, they can at best hope to be viewed by the wider audience as an exhausted haggard mutt with the right scars to show it.